It's Wednesday, and I still find myself in awe of this weekend's Andretti/Kanaan duel. Check out the highlights below, specifically at around the 32:45 mark. The footage doesn't quite do it justice, as Marco had attempted to go high before, and really sold it prior to getting low and making this stick. It was a perfect setup, and perfectly executed. Was this one of the best passes of the season? I don't have footage of it, but I think it has to to between this and Tomas Scheckter passing everyone so far outside he was in the fourth row of the stands at the Indy 500. (And kudos to IndyCar for putting up a 38-minute highlight of this race. When you have a race this good, you need to make sure people see it). A Double At Iowa In 2012? In the post-race euphoria this past weekend, I suggested (perhaps not entirely facetiously) that the series should race in Iowa five times a year. That's probably a bit of overkill, but what about a doubleheader? Right now, there are very few oval courses on the schedule that seem to be working well. Of course, there's Indy, and also Iowa and Texas. I love Kentucky, but I'm not sure how the attendance is going to be this year (up, I hope!). Randy Bernard mentions wanting to retain oval/road balance for the series, and that might be rough to do next year. Hopefully the series returns to Chicagoland (which has attendance issues of its own), but who knows what will happen with Vegas or Milwaukee? For a number of reasons, Iowa just works. It's a packed house, with good racing. If there aren't enough ovals next year to maintain parity, why not do two there, Saturday/Sunday, with both for full points? I'm not sure how things will pan out in the future with ISC or the popularity of IndyCar on certain ovals. But until it happens, it's not a bad idea to fortify IndyCar in places where it's working with an additional race in the weekend. For now, it sounds like the idea is at least being floated, and I can't say as how I blame them. That describes everything about the Iowa Corn Indy 250 we saw Saturday night. It was simply one of the best duels we've seen in some time in the IZOD IndyCar Series. You had two drivers that would not yield, would not surrender, and would not give an inch. In the end, between Tony Kanaan and Marco Andretti, it was Marco who emerged victorious, silencing the critics and doubters for at least one night. At first, it looked like Dario Franchitti would run away with another race. But TK hung around, and Marco charged from his P17 starting spot all the way to the front. In the last 40 laps, it truly was anyone's race between Dario, TK, and Marco. It became largely a two-car battle as Dario's car got very loose, and he began to fade. Dixon passed him, and began to close on the two leaders. TK and Marco swapped the lead back and forth until, with only 18 laps remaining, Marco pulled off an amazing, edge-of-your-seat pass low on TK. TK tried to return the favor, and back and forth at went until TK had to lift when Marco shut the door on a late attempt. Marco Andretti is an IndyCar race winner once again. Andretti Surging: Marco won, Danica was 10th, and Ryan Hunter-Reay had a nice night in 8th, looking very quick indeed. Conway crashed out, but he should be back to form on the road/street courses in two weeks. A scant month ago, we were lamenting the decline of Andretti as they struggled at Indy. This was a huge step to get that team back on track for the rest of the year. 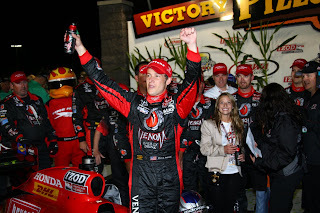 Don't forget, Andretti driver Sage Karam won in Star Mazda, too! Marco gave us one of the best races in a long time. The Grid Walk: Versus introduced an F-1 style grid walk, which was a bit sloppy, but seemed to get a good fan reaction. Let's hope they polish it up and keep doing it. Highlight: RHR paying Wheldon back for dinner. Highlight #2: Robin Miller having to really book it. Dan Wheldon Reigns In The Booth: Speaking of Wheldon, he was spot-on again in his second outing on the Versus broadcast team. It sounds like he'll be in Toronto as well. Versus needs to keep him around. He makes the broadcasts much, much better with his commentary and insight. Mazda Road To Indy Recap: Josef Newgarden was able to increase his over points lead over Esteban Guerreri had the misfortune of losing an engine after leading the first laps of the race. Esteban's going to be hard-pressed to catch back up if Newgarden keeps running this well. Don't forget, we'll see Conor Daly instead of Bryan Clauson for Toronto! With Star Mazda, Sage Karam made it two in a row with a dominant victory Saturday afternoon. Pelfrey Racing had a rough weekend, with Nick Andries having to start last due to a qualifying crash and Connor De Phillippi with a tire problem five laps from the finish. It's going to be a tough fight to the finish for Star Mazda, who we won't see again for about a month. The Dreaded Bump: It seemed like every accident had something to do with that horrid "bump" in Turn 2. It gives the track an added challenge, but also gave us some truly interminable caution periods. Five yellows, encompassing Jakes, Conway, Bia, Power, Saavedra, and Sato, were perhaps the only downer on this race, but did make for some killer restarts. Power's Potty Mouth: Yes, Will Power did say the s-word on live TV. Given that he had a concussion from an pretty nasty hit, I think we can give him a pass. It also sounded like he was less than happy with his team for keeping him out with a damaged car after his contact with Kimball, but hindsight's always 50/50. Not good. Clearly, the ovals aren't kind to this team. ROY Battle Update: This is pretty clearly becoming a Hinchcliffe/Hildebrand fight, if it wasn't already. JR finished 4th, but Hinch managed a 9th to stay close. Hildebrand (who had a somewhat sloppy race despite his good finish) is 27 points ahead, but we're going into some road/street courses, a discipline where Hinch has held the upper hand this year. Charlie Kimball is 25 points behind Hinch in third, and is going to need some better performances to catch him. Bia, Jakes, Kimball, and Saavedra all need to have radically different second halves in this season to have a chance, really. Quietly Having Good Nights: Ryan Hunter-Reay (P8), Ed Carpenter (P11), Alex Lloyd (P13). It's clear that Iowa is quickly become a big jewel in IndyCar's crown. I wish the series could bottle up that magic and send it to some other tracks. Clearly, what Iowa has going is working--great racing, great crowds, and a vibe I can pick up from Indy. Back to Iowa we go this week, the site of Tony Kanaan’s dominant run last year, as well as Andretti Autosport’s last oval victory. Kanaan looked great last week before his late crash (same with Viso), and teammate Taku Sato was no slouch either. They’ll mix it up with Will Power and Dario Franchitti, plus a host of drivers such as Oriol Servia, Graham Rahal, Ryan Briscoe, and Scott Dixon, looking to get into victory circle. Other drivers, such as Ryan Hunter-Reay and Ana Beatriz, look to find traction on a season that hasn’t progressed anywhere near where they would have liked. Mazda Road To Indy Update: Yes, O2 Racing sound like they’re done for the year after withdrawing over the way Lights has been handling penalties. Peter Dempsey a great driver, and we wish him the best and a quick return to the series. We’ll see if anything else develops this weekend. In Star Mazda, that battle between Connor de Phillippi, Sage Karam, Nick Andries, and Tristan Vautier just keeps getting better. Any one of them could win this weekend, and you don’t want to count out Martin Scuncio or guys like quickly-learning rookie Nick Mancuso. What the Star Mazda list lacks in overall entries, it more than makes up for with red-hot competition. Tie Ballgame: Yes, Will Power and Dario Franchitti have split most of the wins this year like Octavian and Mark Anthony dividing up the ancient world. As a result, they're tied atop the standings. You can bet a large portion of the week’s broadcasting will be calculating how the points will changed for them based on where there rival is currently running. One misstep here, though, and the other could jump ahead nicely. Helio vs. Dario: In Dario’s post-race interview, he griped about Helio’s blocking. Helio, for his part, seemed offended and a bit upset that Dario would call him out like that. On one hand, yeah, Helio blocks. On the other hand, so does Dario’s teammate Scott Dixon. On the other other hand, Dario’s been complaining a lot lately. If Helio can run up front again this week, things could get fun towards the end of the race. 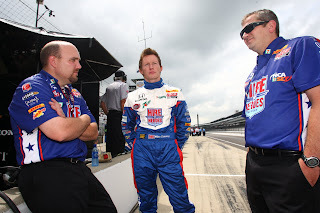 Fighting The Giants: Andretti Autosport, despite their struggles has one once this year, the only non-Target/Penske team outside of Indy to do so. KV Racing and Newman/Haas have been very close several times this year to joining them. 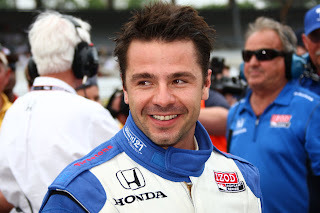 It seems like KV’s creeping ever closer to getting that win, and Oriol Servia is right up front almost every week. If Servia’s going to hold off Dixon for P3 in the standings, he can’t afford to have a down week. Servia & Newman/Haas: Closing in on the W? In The Random Observation Department: Ryan Hunter-Reay will feature Circle K, Sun Drop, and DHL as key sponsors on his car this weekend. Teammate Mike Conway appears to have only Andretti Autosport on the sidepod of his. Wheldon In The House (Er, Booth): Fortunately for us, Dan Wheldon will be back in the booth providing driver expertise for the Versus television audience. Dan did a killer job at Texas, and I think most fans are looking forward to hearing his insight once more. It’d be nice if he were back on track, but I respect his choosing his battles. Simona, Continued: After last week’s nasty Milwaukee crash, we learned Simona de Silvestro had a concussion. Add that to a few burned hands in the last two years and some really nasty hits, and there you have the Iron Maiden (that’s really growing on me). Some have speculated on just where her head is after this rough stretch, and it should be interesting to see how she responds. You also have to wonder just what her car “Pork Chop” has left. It could be a long day for HVM Racing, but either way, Simona will again be a topic of discussion. SFR Status: SFR didn’t seem to have much for Milwaukee. We’ll have to see if they can get back to Indy form at Iowa. Sarah Fisher remains a fan favorite as an owner, and snagging a Top 10 here would be a nice story. At Milwaukee, they just looked well off the pace both in qualifying and the race itself. Ed Carpenter didn’t race here last year, but he finished 10th in 2009, and 6th in 2007. If he can equal something close to that, that will have been a pretty good day. Birthday Wishes: Happy birthday to my friend Rob Mapes of Bloomington, IN, who reads this site and is kind enough to email me when he agrees, and especially when he doesn’t! Rob’s hitting the big 5-0, meaning he’s the same age as NASCAR’s tech manual (cheap shot). Winner: Tony Kanaan. Or Takuma Sato. Or yes, even EJ Viso. I’m riding this KV train until it pulls into station. Hopefully, there’s no more abrupt stops on the way! Have a great weekend watching what should be another great race! Can Hunter-Reay Turn It Around? Take a look at the page currently detailing the overall points standings for the IZOD IndyCar Series. Scroll down, past rookie James Hinchcliffe in P16. Scroll down past Justin Wilson, sitting in P17, Simona hanging on to P18, and another rookie in Charlie Kimball at P19. And yes, scroll down past the crash-prone EJ Viso sitting in P20. That's where you'll find Ryan-Hunter Reay these days, squarely in P21, and only a few points ahead of rookies Sebastian Saavedra, Ana Beatriz, and James Jakes. -At St. Pete, after looking very fast in practice and qualifying, his chances were demolished when he was part of the infamous first-lap pileup. He would return to the race later in time enough to finish P21. -Again looked fast at Barber, but was penalized for taking out Ryan Briscoe. He finished P14. -Looking to repeat his victory at Long Beach, he was running up front with only a few laps to go when he suffered a serious mechanical failure, relegating him to P23. -Started in the front row at Sao Paulo, only to finish 5 laps down in a messy, accident-filled race. -At Indy, he was left out in the cold as he was bumped from the field with no time to re-qualify. Jumped into the #41 of Foyt Racing, he managed only a weak 23rd place, some three laps down. And then, of course, this past week, there was first-lap crash at Milwaukee. Honestly, aside from managing a Top 10 in the Texas race, it's been a nightmare season for the American driver. Is all hope lost for RHR? I don't think so. Consider this: he's coming into a stretch of races where he performed very well last year. 2010 Iowa was an Top 10. Toronto was a podium. Edmonton was P5, Mid-Ohio another Top 10. And though the breaks haven't gone his way, this is still one of the best road-course drivers in the field. You can't expect things to go that badly all season for RHR; sooner rather than later, he'll have his breakout. A win would do a lot to erase some of the bad memories (and don't think he can't pull it off at a place like Toronto or Edmonton). He's too good a driver for this to last. Let's just hope it's soon. Yellow Flag Report: Vitor Meira had to go to a backup car after crashing in practice. Simona de Silvestro crashed in qualifying, and parked it early in the race. Ryan Hunter-Reay said his end just got loose on the first lap. Bia rubbed the wall right before the first pit stop, but was able to come back out. Lloyd got loose, and collided with Saavedra on the day's second restart. JR Hildebrand hit the wall in the turn, with Scott Goodyear reacting like John Barnes was going to summarily execute him in the garage.Viso was having an amazing race, only to crash with just over 80 laps left. TK wiped out while in a position to win. The last was by far the most frustrating, as it seemed as if TK had the best car out there. Newman/Haas Returns: After sort of a down couple of weeks, Newman Haas returned, with Oriol Servia taking a podium and Hinch moving all the way to 6th. Servia's back up to third in Championship points, no small feat when you look at the names surrounding him. 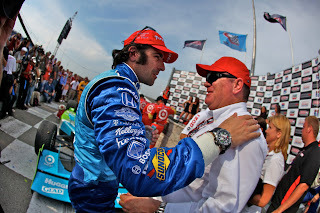 Ganassi Charm Offensive Continues: Dario complained this week in victory circle about Helio's blocking. Given his and Chip Ganassi's running complaint list the last two weeks, there might be about 15 Ganassi fans left by the time they win one of the championships (oval, road, overall) this year. There's something to be said for being a bit quiet and gracious in victory as well as defeat. "Zack's right. We shouldn't gripe so much". KV's Weekend: Honestly, all 3 KV cars looked amazing early on. But that KV luck hit hard. Viso crashed while in the Top 5. TK crashed while pushing for the lead. Sato alone soldiered on to finish 8th. KV can win this year, but things need to swing their way. Pit-Stop Hijinks: What was with that first pit stop? Sato's car goes into Briscoe's box, Dixon gets caught up in, and Taku's car boots a tire across pit road. It caused those driver to drop back to P13-P15, and Sato had to serve a drive-through penalty for hitting a crew member. Dario hit a tire as well, which resulted in a no-call that will probably get some internet grief this week. Personally, I think there needs to be quicker responses and clearer explanations on penalties from the series. Something to work on, in any case. Love That Dad's! : Fitting for Father's Day, Justin Wilson was in the Dad's Root Beer livery for this race. He might want to think about employing it more often, as he was able to nab his first Top 10 since before Brazil. Plus, it's just an awesome-looking livery. Rookie of the Year Update: JR Hildebrand crashed, finishing P21. James Hinchcliffe, on a track he'd never tested on, ran well to finish P6. Charlie Kimball finished P14, and Jakes had a decent result with P15. Bia had a couple of issues, and finished P17. Saavedra crashed out in P23. Right now, Hildebrand leads Hinch by 17 points, with Kimball in 3rd 15 points behind The Mayor. Saavedra's 21 points behind Charlie, and Bia and Jakes now find themselves tied just 4 points behind Conquest's driver. Mazda Road to Indy Update: Star Mazda didn't get to race until after IndyCar due to weather, but those who stuck around saw Sage Karam rocket away for the win. In Indy Lights, Esteban Guerreri got the victory with a nice performance over 2nd-place Joseph Newgarden. Lights also saw all manner of confusion as the #7 and #11 cars were reported as failing tech, only to see that quickly retracted. (There's also O2RT withdrawing; I don't we've heard the last of that, so keep your ears open). In USF2000, Northern Ireland's Wayne Boyd had an excellent race to grab his first series win over 2nd-place Zach Veach. Next Up: No time to rest, as the series heads to Iowa next weekend! The Mazda Road To Indy Returns! : After missing out at Texas, we get a full slate of Mazda Road to Indy events. In Firestone Indy Lights, Joseph Newgarden will look to follow up on a great performance at Indy with another win, while USAC ace Bryan Clauson gets to give it another go. In Star Mazda, Connor De Phillipi attempts to keep the victories coming, while teammate Nick Andries looks to take a victory of his own, and France's Tristan Vautier looks to challenge as well. We also get to see some USF2000 action, so there’s definitely a full slate going on. If you aren’t following the INDYCAR ladder series this year, you’ve been missing out on some great talent and some great racing. Kite Flying: In the USAC Silver Crown event this weekend, it's interesting to note that former IndyCar driver Jimmy Kite will be competing in Silver Crown for the first time in six years. He'll be driving a car driven by Eddie Sachs, Jr. Oval Challengers: Seriously, can anyone top Ganassi or Penske on an oval? After Texas, you have to wonder. Tony Kanaan had a great race to do exactly that at Iowa last year, but Milwaukee’s an easy track to find yourself a lap down early. This might not be the week for a new winner, but you never know. Livery Notes: Ryan Hunter-Reay is sporting Go Daddy colors this weekend, while Mike Conway has some DHL/Sundrop sponsorship on his ride. Ed Carpenter will be in the familiar black/yellow paint scheme, but with Direct Supply as a sponsor. Justin Wilson will have the always-popular Dad’s Root beer livery, while Dario will give up the Target red for a green-and-blue Downy scheme. Meanwhile, Ryan Briscoe will be in a sharp black-and-blue design for Transitions Adaptive Lenses. Basically, get used to some different schemes this week. KV Momentum? : After a very good, clean weekend for KV Racing, they’ll look to build on those results from the Texas races. Can Takuma Sato and Tony Kanaan hang around at the front of the field? Can EJ Viso keep it clean and follow up on two Top 10 finishes? You hear it a lot: this is a fast team, but they need to stop with the carbon fiber destruction. Texas was a nice step forward; hopefully Milwaukee isn’t two steps back. Eye On Rahal: If Graham Rahal’s going to excel on another oval this year, it just might be Texas. He started second here in 2008 and 2009, and had a nice P4 finish the last time the series visited the Mile. He’ll need it if he’s going to keep pace with that front pack in championship points. Traffic, Traffic Everywhere: On a one-mile track, there's plenty of traffic no matter where you are. There are "only" 26 cars on track this week instead of Texas' 30, but the series will probably be hard-pressed to come away with one a single caution flag like last week. Pole Run: Alex Tagliani’s won two poles in a row. Can he make it a third at Milwaukee, but as a bigger question, can he find the same speed in the race itself? Pole Position: Scott Dixon (though I’m pulling for Tag to make it three in a row. How could you not, honestly?). Have a great weekend and a great Father’s Day! I want to again briefly talk about a driver I don’t think gets enough credit given his level of talent. He’s done more with less than perhaps any driver in the field. Yep, I’m talking about Alex Lloyd. The 2007 Indy Lights champ and originally a developmental driver on retainer with Target Chip Ganassi, Alex languished mainly on the sidelines for a couple of year before he got his full-time ride. That’s not to say he didn’t show flashes; in 2009, in the HER Energy Car, “Pink Lloyd” qualified 11th for the Indy 500 in a one-off program, and finished 13th even after going a lap down due to a broken light. I'm still not sure how he did it. 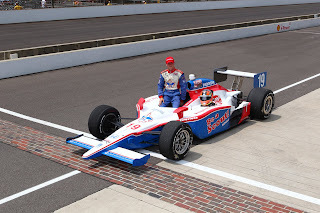 ﻿ In 2010, Dale Coyne signed him to become the #19 Boy Scouts of America driver. Now, I have a lot of respect for Dale Coyne and how he keeps returning year after year, but that’s not exactly a marquee ride. He managed some nice Top 10 finishes (including a stellar 4th place run at Indy!) on his way to snagging Rookie of the Year honors. You couldn’t have asked for much more out of him, really. This year, Alex is only running the ovals for Coyne, but has already proven his mettle with a gritty, redlining qualification effort in the waning minutes of Bump Day to make it into the field. I honestly don’t think anyone there thought that car had the speed to make it. Lloyd afterwards said the vibration in the car was so bad, he couldn’t see on the last lap of the run. His oil pressure skyrocket; he feared he might lose the engine. It was an old-school, edge-of-your-seat run that seemed to belong to a tougher, historical era of Indy. It belonged to 1951 or 1961 as much as it belonged to 2011. I also like Alex because (proud Hoosier I am), he’s decided to make Indy his home. He’s raising his kids here, and really is starting to feel like a “hometown” driver. He’s been nothing but friendly and accommodating every time I’ve run into him at the track. There are many drivers I hope find the sponsorships or partnerships to race full-time, but Alex Lloyd has to be right at the top of that list. I’m not sure how the rest of his season will play out, but I hope it leads to great opportunities in 2012. I'll admit, I felt strangely down after Saturday's twin races. 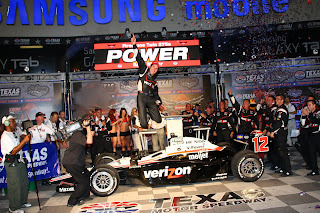 Maybe I hyped it up too much within my own head, perhaps it was a case of Penske-Ganassi Victory Fatigue. In any case, things appeared brighter the next morning, and you have to congratulate Dario for another masterful performance along with Will Power for finally getting the oval monkey off his back. Random Draw Reactions Mixed: Dario Franchitti, Will Power, and multiple other drivers commented on the random starting position draw for the second race, saying it was unfair at best. I personally really enjoyed the draw segment in the field, but it does seem as if fan and driver opinion is trending towards field inversion for the second race. Wheldon Excels: Dan Wheldon wasn't in a car Saturday night, but still gave us some of the best commentary and driver analysis we've seen in a long, long time. The reaction to Wheldon's commentary in the broadcast booth was overwhelmingly positive, and it's clear he has a future in broadcasting when he finlly hangs up his helmet. His teaming with Jon Beekhuis on the mike was pitch-perfect all night, and made for a great duo. Chip Ganassi, Lovable Curmudgeon: No, not really. Every time Versus interview the Chipster Saturday night, he was complaining about backmarkers in a "dang kids on my lawn" sort of tone. Frankly, he came off as if he felt 28 other cars didn't belong on the same track as the Target Chip Ganassi Cars. For at least the first race Saturday, he may well have been correct. Andretti Fights Back: The Andretti cars didn't do much in the first feature, but they made a nice showing in the second. Ryan-Hunter Reay started near the front in race #2, but still had to fight his car to finish P9. Mike Conway didn't have much of a car, but still advanced 9 spots (P17) in the latter race. Danica made a nice run in that race as well to finish P8. Perhaps the best run of the night belonged to Marco Andretti, who started P27 and finished P6 in the second race. KV Shows Well: Finally, a good night overall for all the KV cars. Takuma Sato finished a very strong P5 in race #1, with EJ Viso 7th and 10th, respectively, in the two races. Tony Kanaan drew the pole in the second race, but didn't have the speed to take victory, settling for P5. Most importantly, though, KV Racing got through the night without a single incident. Rookie Battle Still Murky...: JR Hildebrand struggled after a strong qualifying effort, finishing P23 and P18 in the two races. James Hinchcliffe had an mediocre (by his standards) night, finishing P20 and P19. Charlie Kimball finished P30 and P23, and lost a little bit of ground in the ROY chase. The battle will spill over to next week. ...But the Champ Battle Isn't: Things are beginning to look more and more like many thought they would at this point at the season, with Will Power, Dario Franchitti, and Scott Dixon your Top 3 in the overall points battle. Orio Servia's weak showing at Texas (only 13 points total) loses him a spot to 4th overall, and TK remains a distance back in P5, with Ryan Briscoe gaining on him. We're 1-2 races away from having an all Penske/Ganassi Top 4. Nowhere To Be Seen: Monkey. Helio Endures: It's been an awful season for Helio Castroneves so far, but a 10th and a 4th that were incident-free were nice building blocks. He moved up two spots in the standings, and showed signs of getting back into this thing. Howard's Night: If you missed it, Jay Howard was a blast to watch in the first race, aggressively moving up 13 positions. It's nice to see someone get another shot and do pretty well with it. Plus, it sounds like Rahal Letterman Lanigan Racing might be putting together a few more races, so there's hope for seeing Howard or possibly Bertrand Baguette at least once more. The Battle For 22nd: Depending on what happens with TEAM money on the offseason, being in outside the Top 22 cars in points could be injurious to your racing program's health. Right now, Sebastian Saavedra, Ana Beatriz (plus Pagenaud's points), and James Jakes are all looking like it might come down to them, with Viso a possibility unless he has more races like Texas. If any one of the usual backmarkers can put together a big finish, that could give them some breathing room. As it stands now, the fight remains a race-to-race proposition. Carpenter's Pattern: Ed Carpenter has qualified well now at Indy and Texas, but seems like he's fighting the car all race long once the flag drops. Ed and Sarah Fisher Racing have shown some great speed and managed a good finish at Indy, but it seems like they still need to put a full race together to reach the top. SFR dropped 19 combined spots between the two races. Davey's Last Race? : The rumors were Davey Hamilton would be retiring after Texas. Even though his results were generally poor last night, it's tough to find a nicer or more inspirational guy in the paddock than Davey Hamilton. I hope we see him Vegas, but if not, let's have a big cheer for a genuinely nice, humble, and dedicated racer. A Few Words On Alex Lloyd: Alex doesn't always get a lot of attention, but he should. He made an incredibly clutch run to just make the field at Indy, and at Texas, he took a car with some substantial drag issues to move up 11 spots in the first race. You get the feeling that if he would just get a somewhat more competitive car under him, he could set things on fire. In any case, because he doesn't get enough attention, kudos and cheers, Alex. Next up is the Milwaukee Mile this weekend. A Full Field: We’re looking at 30 entries for this race, including part-timers such as Davey Hamilton, Wade Cunningham, and Ed Carpenter. Texas is already a crazy track; we’ll have to watch to see who can stay out of trouble out there. The Format: With the “twin” races, the second race starting positions will be determined by a random draw. With this full, full field, it’ll be exciting to see who can charge through the ranks in a shorter-format race. Danica’s Chance: With Motegi’s oval off the schedule, this might be Danica Patrick’s best chance to nab a win this year. She’s had two Top 5s and two more Top 10s here in the past 4 years, and this is one of the track she seems to be best on. She had a good fight with eventual Texas winner Ryan Briscoe in 2010; let’s see how this format does for her. Andretti’s Ovals: Andretti Autosport was dismal in Indy qualifying, but Marco and Danica picked it up when it came to the actual race. It’ll be interesting to see how they respond to an oval where the team has been pretty good in recent years. Can Conway and Andretti get back on track? Howard Rides Again: Jay Howard’s getting at least one more shot in the IZOD IndyCar Series this week, after a lost wheel doomed his day at the 500. We’ll see what he’s got this week, and if Texas holds more luck for him than Indy. Rookies, Continued: Despite being very close in qualifying, JR Hildebrand jump out to a larger lead (33 points) over James Hinchcliffe in the Rookie of the Year standings. Hinch needs a good result to stay close until the schedule swings back to the road/oval courses. By merit of his 13th-place finish, Charlie Kimball is only two points behind Hinch in the standings. Of course, everything might hinge (no pun intended) on Hildebrand’s injured knee, though I think he’ll be fine for this race. Will The Real Sato Please Stand Up? : Is Takuma Sato the driver who probably should have won in Brazil, or is the guy crashing out early in Indy? Every time we think Sato might be getting over the case of the “crashies” he had last year, something happens to make us doubt that. Texas is going to be a busy track; which Sato shows up will be the key to whether his vehicle survives into the second feature. Can Penske Prevail? : It’s been a rough season for Penske thus far, outside of Will Power’s road and street course dominance. If they’re going to get back on course, the track where Briscoe won last year is a pretty good starting point. The Vengeance of Chip: Don’t think Chip Ganassi’s Target team is pleased—AT ALL—with a 5th and 12th at Indy. Expect them to come out strong at Texas, and I would say they’ll have to be a favorite for at least one of the two races. New Blood: With 30 drivers, a random draw in the second race, and probably some chaos in the middle of everything, this might be one of the best chances on the schedule for one of the smaller teams to grab victory. Will someone new find their way to the front, or, if put there, can they hang on? Time will tell! Winner (2nd race): It all depends on the draw. Hopefully, we see a fresh face take the checkered! Enjoy what should be a very different sort of race weekend! We'll be back here Monday with a recap! Every year after the Indy 500, I have a bit of a letdown. I suppose it’s a mix of sadness that it’s all over for another year, exhaustion a very busy stretch of time, and being busy catching up on everything I simply stopped work on to go to the Speedway instead. (Of course, trying to recover from the always near-terminal sunburn doesn't help!). It’s as if you get to live around this amazing world for a short time, only to get thrown back into the daily grind. After a few days, though, I’m ready and raring to go—case in point, I cannot wait for the Firestone Twin 275s this weekend! Am I the only one who gets the post-Indy “blahs”? One thing’s for sure—I’m glad it doesn’t last long. Of course, Texas Motor Speedway is a pretty good remedy for that sort of thing. The Next Three Ovals: Who Wins? Last year, the Ganassi and Penske cars dominated the oval tracks (they dominated the twisty ones, too, but that's for another day). Aside from Tony Kanaan winning at Iowa, no other team could crack the big team dominance on the oval courses. This year, of course, we have one of the smallest outfits (Bryan Herta Autosport) winning the Indy 500, while the Penskes struggled and the (Target) Ganassis could not take advantage of dominant cars. Does that mean another team has a good shot at winning on these next three ovals on the schedule? The Firestone Twin 275s: Actually two races in one, the format of this pair of races (shorter, with a random draw determining field order for the second one) would seem to play right into the hands of there being at least one different winner between the two races. We're also looking at 30-31 drivers for this race, which means working your way through a long field if you get a poor draw. The Milwaukee Mile: We've had a year away from this race, but before that, 2009 saw a battle between Ryan Briscoe and Scott Dixon, with Dixie finally getting the win. Iowa Corn Indy 250: TK won this event going away last year, so there's definitely hope for smaller teams doing the same this year. This has been a very competitive track, and it should be interesting who shows up with what it takes this year. Bottom line, while I don't expect much slipping from Ganassi or Penske, I think we see 1-2 new winners between the four races held on these tracks. I'm especially interested to see if KV Racing, Panther Racing, and Sam Schmidt are solid. as they were at Indy. This portion of the schedule will also be a trial balloon, in part, to see how teams might do at tracks such as New Hampshire, Kentucky, and Las Vegas. This should be a good few weeks coming up for fans. Three events in quick succession are just the remedy for post-Indy doldrums. It’s time once more to look at the Top 15 in the IZOD IndyCar Series points standings. Needless to say, after Indy, we had a lot of big moves. Let’s take a look at how things shook out in the aftermath of a wild and unpredictable 500. As always, the positions gained/lost from the last update are listed in red. Despite three-wheeling it at one point at Indy, Will Power remains 16 points ahead of his nearest competitor in the overall points standings. Winning a lot of races tends to have that effect. Can he grab that elusive first oval win in one of the twin races at Texas? 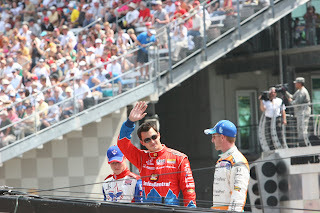 For most of last Sunday, I was pretty certain Dario was going to nab his third Indy 500 victory. As it did all month, the smallest margins of fuel shortages destroyed his chances. I like him to rebound in a big way, and soon. Servia drove a fine race at Indy, but it seems like he felt he could have accomplished a bit more. The most consistent driver out there right now will look to give Newman/Haas their first victory in a while next week. They’re close. Another Indy 500, another year of waiting for TK’s elusive trip to the 500’s Victory Circle. He had a great race, though, and has to be the highlight for KV Racing in an otherwise mixed season. I still like his chances to snag a win at some point this year. Dixon was furious after short-fueling doomed his chances at a second 500 victory. It’s been an up-and-down season for Scott, but he’s still in the championship mix for the rest of the season despite his disappointments. After a slow, disappointing start, Rahal has begun to show the form that most of us hoped to see when he signed on with Ganassi. If he can keep up the charge, the folks in front of him in the standings will have great cause to be nervous. Rahal has plenty to smile about lately. Briscoe suffered more 500 disappointment, crashing in both qualifying and the race. He can’t seem to quite get on track this year, but don’t forget he was the winner at Texas last year. You wouldn’t expect the Indy pole winner to drop two spots overall, but that’s just what Tagliani did after an early exit last Sunday. Still, you have to admire the late-career renaissance he’s been able to put together so far, and the positive overall direction of Sam Schmidt’s team. No top driver in the series was perhaps more hurt by Indy than Conway, who found himself on the outside looking in after qualifying. He’ll have to work his way back up on a series of ovals, which should be an interesting gauge of where he is outside of the twisty courses. It was a pretty run-of-the-mill 500 for Meira, who wasn’t as competitive as many had hoped after his strong Pole Day qualifying. He nudges up a spot, but we’ll have to see if he can get another string of Top 10s going at Texas. Marco recovered nicely from a near-catastrophic bout of qualifying at Indy to finish P9. His season had a very rough start, but it might be looking up a bit as we progress into some of the ovals. Just when we think Takuma Sato has shaken off his crash problems this year, he end up as the first driver out at Indy. With the nightmare of EJ Viso continuing, KV Racing really needs Sato to return to good form through the rest of this season. A silver lining was his qualifying run at Indy, which just missed the first three rows. Simona gave us one of the all-time gutsiest qualification stories, but her day ended early when it came to the race. She admits to not quite yet being back where she needs to be confidence-wise, so we’ll have to see how she manages in these next few races. She led laps late at Indy, and managed a solid P10 overall on the day. With the thought that she’s gone to NASCAR next year, she’s running out of racing in which to claim another IndyCar win. Texas might be one of her best remaining chances, as she can definitely get around that track. Dropping out of the top 15? That be Justin Wilson (down two spots to P16). A fun twin-race format at Texas beckons next week, so we’ll see who can grab a win and work their way back up the standings! Looking back on what was the Month of May at Indy, I think one of the things that impressed me most was the continuing access I’m granted as a fan of IndyCar. To be clear, I’ve attended plenty of other types of sporting events. I’ve attended Fan Appreciation Day for the Kansas City Royals. I’ve attended regular-season and playoff games for the Indianapolis Colts. I’ve been to AA and AAA baseball games, and as a student, I watched several Purdue football games up close. Young fans grow up to remember these moments. None of the above offer as much fan accessibility as the IZOD IndyCar Series. 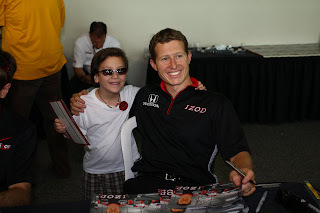 Consider this, just in the Month of May alone, my daughter met Alex Tagliani, Townsend Bell, Alex Lloyd, Dan Wheldon, Pippa Mann, and Ed Carpenter. As just a regular fan, I got to meet all of the above plus Bertrand Baguette, Jay Howard, and Davey Hamilton. John Andretti and Ryan Hunter-Reay almost ran me over (my bad). I met Rick Mears, both in and out of an autograph session. I grabbed the autographs of Arie Luyendyk and Jimmy Vasser. Amazingly, I was able to meet 500 legend, businessman, and innovator Andy Granatelli. This was all done just as a fan, nothing special or nothing that any other fan couldn’t do. Few sports have the sort of fan interaction with their stars as we do in IndyCar, and it isn’t just for the Indy 500. The series does an amazing job of organizing autograph sessions, meet n’ greets, and other special fan events. IZOD IndyCar Series and Mazda Road to Indy teams and drivers have embraced Twitter and social media, ensuring that even fans from far away can still be a part of news and contests in close to real-time. Whatever else you think of what IndyCar is doing these days, they’re really offering fans a lot of ways to keep close to their sport. I'd encouraging them to continue to focus on bringing in the youth as well; offerings such as making Gasoline Alley admission allowed for ages 9 and up, as well as the excellent IMS Kids Club, are really positive steps. I'd love to see the IZOD IndyCar Series as a whole embrace that direction as well.